I know that ever since arriving in Guatemala last month I promised to send you some inspired new recipes. And TODAY I’m finally doing it!!! To be honest, the first few weeks here I was not inspired to cook. I was living in a hostel with a shared kitchen and not having my normal ingredients or cooking utensils (like a blender that works) made it really difficult for me to be inspired. Since moving into my own space just 2 weeks ago, I’ve been loving having my own kitchen. I still miss my Vitamix but I’ve been managing OK! So, here it is. A recipe that I’ve wanted to create for a few weeks now and I’m so excited that just this weekend I finalized it and am ready to share it with you —- Guatemalan Tipico Breakfast! Plantains are another staple item here… as with most Latin countries. And as much as I LOVED plantain chips when I traveled South America, I haven’t experimented much with them myself… until this weekend. So, all of these carbs – where’s the protein and vegetables? I had to spice it up. Add some healthy additions and create this incredibly nutritious and filling breakfast. I’ve had the meal a few times (once for breakfast and twice for lunch) and every time I notice that I’ve been full for HOURS. 1. Heat 1/4 C oil in a large frying pan over medium-high heat. While the oil heats, cut the plantains in half. Then slice each piece lengthwise again. You should have 8 long pieces. Once the oil is hot add them into the pan and cover with a lid or splatter screen. Leave them frying for 5 minutes or when browned and then flip them. Once they are brown on both sides, transfer to a paper towel covered plate and let them sit while you prepare the rest of the feast. 2. In another medium frying pan, add the 1 tsp of oil and heat over medium-low. When the oil is hot, add the tomato and onion. Saute for 3-5 minutes. 3. In a small bowl combine the eggs, a splash of water, salt, pepper, and spinach. Whisk to combine and add them to the pan with the tomato and onion. Reduce heat to low and cook until the eggs are light and fluffy (be careful not to overcook the eggs!). 4. Prepare the beans. Place the beans in a small bowl and using a potato masher or your hands, mash the beans until half are soft and half are intact. 5. Push the eggs to one side of the pan and add the beans. Heat thoroughly and then turn off the pan. Place the tortillas on top of the pan to heat a little. 6. Time to assemble the plate! 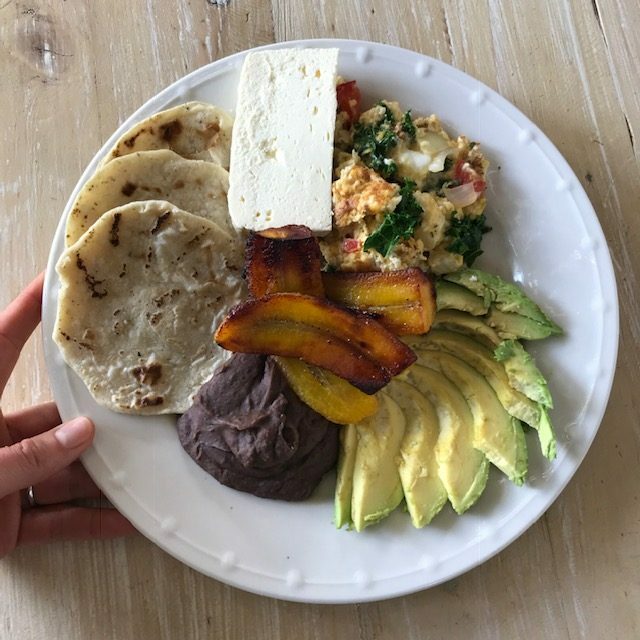 Dish out the eggs, black beans, plantains, sliced avocado, cheese, and tortillas. Do you want even more mouthwatering recipes just like this one? 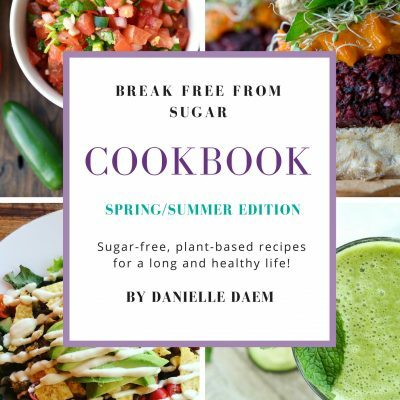 The sugar-free recipe library within the Sugar Freedom Collective has you covered! With over 100 recipes and counting, it will quickly become your go-to place to grab a quick and healthy recipe. Join us in the collective to get access to the recipe library AND all the support, accountability, resources, and fun that you need on your journey to sugar freedom!